Terrifying secrets revealed! Our intrepid reporter risks life and limb to bring you stories of the mysterious Room 207, hidden ghost towns, the alien (architecture) invasion, and more. Cast of characters includes an East Village witch and a subzero rabbi. Plus inside info on the best spots to drink, eat, and just hang out. When a website owed us money for two articles and we could not get paid, we did LEXA ROSEAN's spell to collect debts and got both checks within two weeks. When the apartment next door was vacant, we used one of her spells to attract quiet and sane neighbors. We're hooked. Rosean is a Wiccan high priestess and author of several funny books of spells. During her tarot card readings, she's a cross between a psychic and a shrink. 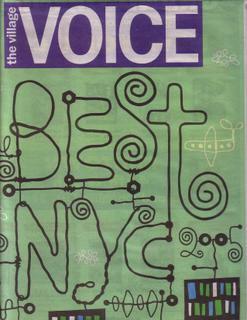 COPYRIGHT 2005 by Village Voice.